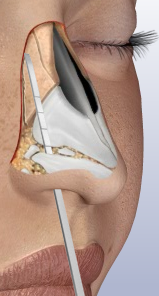 Nose Revision Surgery and Surgeons: Does a narrowing of the nasal passage-way simply mean correcting the collapsed valve region with cartilage grafts? Does a narrowing of the nasal passage-way simply mean correcting the collapsed valve region with cartilage grafts? After my second major nose revision which involved spreader cartilage grafts I ended up with unusual narrowing on my right nasal passage way. It was different then the valve collapse feeling I had experienced prior to this surgery back in 2001. I noticed by touch that the area of my passage way became much smaller; my natural septal cartilage slanted out towards the opening of the nostril (caudal septal deflection) and with a hand mirror I noticed a more slit like appearance further upwards. My nasal bridge is slanted slightly towards that side as well on visual inspection. But to my surprise every nose surgeon that I have seen claims my septum is fairly straight and what I need done is major grafting to support my nose due to nasal valve collapse. I always had some reservations about this as being all there was to it, however these surgeons reassure me that grafting helps you breath better so the nostrils don't close up with inward breathing. In 2005 I unfortunately had surgery with a young novice surgeon who claimed he knew how to fix my problem. He ended up putting very small pieces of cartilage on each side of my nose as a alar graft, however it only added to the problem. He apparently didn't make the grafts long and thick enough to make a measurable difference. Therefore it has only added weight to the region, and unfortunately he did a lot of reduction surgery which left me with host of other problems. Fast forward to today, i still have this narrowing on my right side which needs correcting. My right passage way is touching in certain regions in a stationary position (without breathing inward) throughout most of the day. I have seen a couple of examples of people online who claim after they had cartilage grafts done on their nose for nasal valve collapse they still didn't feel their breathing was much improved. So what is going on here? Of course it could be that the surgeon they had may not of done the surgery properly; the grafts may not be in right place or too large or small, or migrated after the surgery, etc. But what if there was another underlying problem that the nose surgeon didn't properly diagnose prior to surgery? I have thought about this because of my situation, and after coming across some information in my research , a couple things stood out. In my post titled 'Surgical options for treating Internal nasal valve collapse obstruction" it discusses how surgeon can improve the cross sectional area (changing the internal valve angle) simply with Flaring Sutures or with Prolene Suspension sutures. It states that "although the spreader grafts moves the dorsal border of the upper lateral cartilage in a lateral direction, the angle of the Internal valve is minimally affected. That post also discusses outfracture osteotomy of the nasal bones to widen the valve angle. Occasionally severe valve narrowing occurs after rhinoplasty as a result of Lateral osteotomy with infracture. These patients can be treated with revision osteotomy with outfracture of the nasal bones to widen the valve angle. A change of 1 degree in valve angle increased the area by approx. 4mm2. I started thinking about whether or not my previous surgeon in 2001 did an infracture osteotomy on me. Could this be a missing piece of the puzzle to explain at least partly my narrowing condition resulting from that surgery? So I looked back at my operative report from 2001 and low and behold an infracturing osteotomy was performed on my right side. It said "the nasal bones were deviated to the right and therefore bilateral piriform incisions were made with osteotomies and infracturing, with good alignment". So whether or not cartilage grafting would be enough to resolve my problem is something I will have to question now being aware of this. This proves how important it is to have your operative reports and to understand them. There were other things in the report which I only recently realized were not done according to recommendations such as the size of the L strut left behind in my septum. So if you've had a failed rhinoplasty, and not sure or fully content you have received answers to why you ended up with the poor results you have, do yourself a favor read and reread your operative report and research the medical terminology for better understanding. Just a quick mention, here- sometimes reports don't mention everything that was performed in the surgery, but don't discount the reports either, they may explain exactly why you are experiencing the problems you now live with. I will discuss osteotomy's in greater detail in a future post.